Radolfzell/ Mainau Island (Lake Constance), Germany. “For all the massive deforestation happening in Romania, the country still is the last within the European Union to harbour substantial areas of really primeval forests. That’s what I am fighting for. I will not rest until Romania’s paradise forests are safe”, says Romanian biologist and campaigner Gabriel Paun. For this outstanding commitment, today he received the EuroNatur Award 2016 on Mainau Island (Lake Constance). 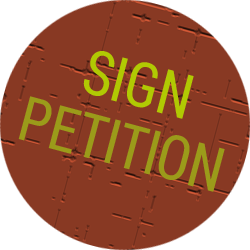 “The destruction of the Carpathian old-growth forests is a European issue and a concern for all of us. This unique European natural heritage is being destroyed for short-term profits, largely illegally, in spite of national and international conservation provisions,” says Christel Schroeder, president of nature conservation foundation EuroNatur. Week after week, thousands of trees are being cut down – many of them in areas that had been untouched by man for centuries and that are among the most magnificent forests that we have left. “By giving this year’s EuroNatur Award to Gabriel Paun, we send a clear signal for the protection and against the destruction of Europe’s last primeval forests. We are honouring his courage in uncovering the scandalous deforestation and his braveness in fighting a seemingly insuperable opponent,” states Christel Schroeder on the reasons for selecting this year’s laureate. 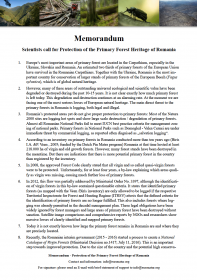 The Romanian authorities are not strictly enforcing the primeval forests’ legal conservation status. Not even if they are situated in a national park or an area protected by EU laws, centuries-old giant trees are safe from the chainsaws. 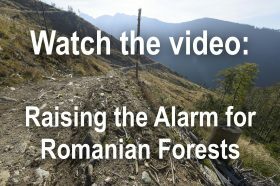 Romania currently still harbours 60% of the continent’s remaining old-growth forests (excl. Russia). But over the past ten years, vast areas of these more than 6000-year-old forest ecosystems have been destroyed. The wood is also being sold in German DIY stores. EuroNatur Award: The EuroNatur Award is non-monetary. It shall honour outstanding commitments in the field of nature conservation. Laureates of previous years include Jonathan Franzen, Prince Charles, Mikhail Gorbachev, Nelson Mandela, Dr. Ernst Paul Dörfler, Prof. Dr. Klaus Töpfer, and Hnutí Duha (Friends of the Earth Czech Republic). Receiving the EuroNatur Award in 2014 provided the Czech nature conservation organisation Hnutí Duha with the necessary international backing to significantly progress wilderness protection in Šumava National Park. The EuroNatur Award 2016 was given on 12 October 2016 at 5 p.m. to Gabriel Paun on Mainau Island (Lake Constance). Gabriel Paun is a Romanian biologist campaigning for nature conservation and animal protection. Working for Greenpeace, he was instrumental in achieving a ban of genetically modified soy in Romania. He’s also active for Four Paws and Animals International. For many years he has been campaigning for forest protection. Among his achievements is a halt to illegal construction works on route 66a through Domogled and Retezat National Parks in Romania which harbour some of the last primeval beech forests of Europe. Since 2009 Gabriel Paun is founding president of the Romanian nature conservation NGO Agent Green.